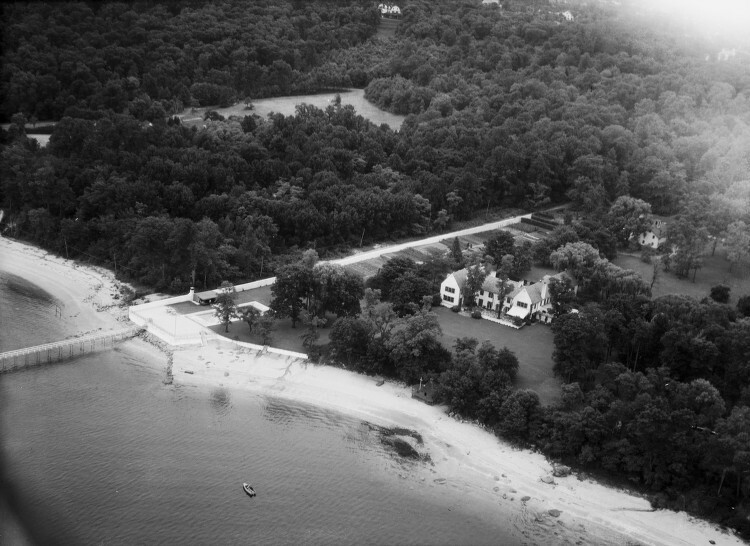 'Cloverly Manor', the Vincent Astor estate designed by Delano & Aldrich c. 1922 in Sands Point with landscaping by Annette Hoyt Flanders. Astor was the son of J.J. Astor IV and took over the Astor family real estate holdings following his father's death on the Titanic in 1912. In 1933 the residence was sold to Allan J. McIntosh, partner in the brokerage firm of Davis & McIntosh. McIntosh had been leasing the home as his summer residence since 1931. This aerial is part of SMU's Robert Yarnall Richie collection and was taken between 1932-1934. Click HERE to see 'Cloverly Manor' on google earth and HERE on bing. Who knew that Vincent Astor lived in Sands Point? I know that he had inherited Ferncliff, the huge Astor property outside of Rhinebeck, NY as well as Beechwood, his Grandmother's Newport pile. He also had a rather famous yacht on which he liked to cruise the world. I wonder when he found the time to visit Long Island? From the dates of his ownership, it would appear that the answer was "Not too often". It would seem that if he did ever live in Sands Point it was very briefly. The 1933 NYTimes article on the sale of this place to McIntosh notes that Astor had purchased some land in Bermuda to build a winter residence. I've been idly calculating the annual maintenance costs for the grounds -- which are about as immaculate as they could be. Has anyone seen recent summer pictures of the gardens? I was recently at one of the finest houses up here, built for a textile heiress and her mining heir husband in the 1930's. All the careful understatement money could buy. It was purchased a few years ago by well known money manager, and enlarged (it was not tiny before)and given a general tune-up (the previous owner, a contemporary of my grandmother's had lived there with a staff of eleven to maintain her considerable understatement). It was clear that many of the other guests, well heeled themselves, were doing the very same calculations that you were doing---and arriving at the same hair-raising conclusions. Has anyone seen photos of the original Ferncliff? I beleive that Vincent Astor tore it down and moved to the "Casino"- a Stanford White designed sporting complex on the property. Apparently, Brooke Astor hated the Casino, which despite the glorious views elswhere on the property looked out on nothing, and even after a fortune spent reconfiguring it, made an awkward and uncomfortable residence. I have often wondered what prompted the enormously rich Vincent Astor to tear down the family seat. It must have been a behemouth. Thanks DED- I actually rather like Ferncliff- although it must have struck Vincent's generation as hopelessly old fashioned. And I can only imagine the dichotomy between the exterior and the gilded and velveted interiors that I'm sure Baumgarten/Alvoine/whomever installed. There's nothing quite like a nice Louis XVI drawing room in an overblown Victorian Hudson Valley farmhouse. I stand corrected on the views from the Casino. I was almost certain that I read somewhere that Brooke Astor hated the place and was sure that "no views" was among her litany of issues with it. A quick google search, however, seems to indicate that the views are pretty spectacular. And am I getting old or are the security words and numbers becoming increasingly small and fuzzy? The security words have been impossible for the last few days. Really delightful at Rhinebeck are the stone barns erected by Vincent Astor, more recently the studio and home of Annie Leibowitz. And according to 'American Contractor', vol. 43, the cost of construction was to be $250,000. Great links DED- Thank you. I have always loved the Oblensky house-one among a number of my fantasy residences. This all puts me in mind of a story I once read about Vincent Astor's dreadful, monumentally self centered mother, Ava Willing Astor: As she got older, she became increasingly sour and unpleasant. Late in her life, she was spending the week-end with some family friends. The week-end was apparently almost totally devoted to her carping and complaining about every subject that came under discussion, despite her hosts concerted efforts to lighten the mood. At the end of the interminable week-end, her hosts were standing by the front door to bid her a final good-bye. With a great sigh she turned to them and exclaimed, "Isn't life dreadful". Then she stepped mournfully into her chauffered Rolls Royce. The original Ferncliff was torn down at the insistence of Minnie Cushing Astor. The Playhouse has no views from the main living room, which only looks onto the tennis court, as I recall. It is not a great building- the ceilings are too low for the size of the rooms and the details are mediocre at best. Trumbauer would have done it better. I rather like Cloverly Manor and clearly its escaped (thus far) from being razed, modernized, or edited to such an extent it exists in name alone. The lovely stone barns of Ferncliff are now the private home of Annie Leibovitz. (Acquired in 1996 - 220 acres for $2.3M) They were secured as part of her debt reorganization in 2009. "I was recently at one of the finest houses up here, built for a textile heiress and her mining heir husband in the 1930's"
Ah, Dilettante, always letting us know you have the ammunition to name-drop but the taste not to. You little tease. Can confirm that the best views from Ferncliff are where the original house stood now occupied by buildings of the Catholic Church. The only decent river views from Astor Court are from the tennis court wing. Also wasnt a favored family home due the close proximity to Amtrak's rails. Ferncliff and many other historic homes have been featured through the years on the Hudson River Heritage Country Seats Tour which takes place each Fall. It's highly recommended. He must have spent some time here on Long Island. There are many pictures of he and his wife at Belmont. NYC.... after Vincent died, she told me that Laurence Rockefeller found her "Holly Hill", her Delano & Aldrich designed house at Briarcliff Manor.